We floated placidly on a calm evening catching the last rays of sunset above the trees of Agate Bay. We slowly spun around toward the east to watch the moon peak its way above the East Shore of Lake Tahoe. I’ve always felt that the best way to experience Lake Tahoe is by getting on it. 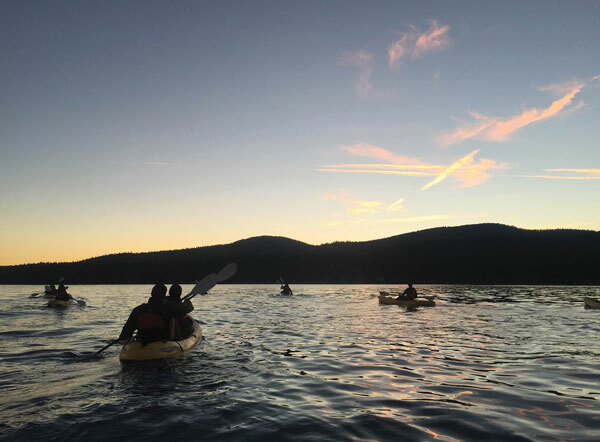 Now I know one of the best ways to get on it is as part of a full-moon kayak tour with the Tahoe Adventure Company. We slowly spun around toward the east to watch the moon peak its way above the East Shore of Lake Tahoe. I joined a group of 19 on the lake Memorial Day evening. The tour started at 6:30 p.m. at the Tahoe Vista Recreation Area beach. Many in the group were first-time kayakers and the three guides did a great job of making them feel comfortable. 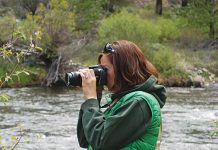 The guides also passed on all sorts of interesting facts about Lake Tahoe. Although it was the first warm day on the lake in a while, the guides knew the temperatures would drop and provided rain pants and jackets for all the participants. Once the sun goes down it gets cold here. Many a shivering Fourth of July beach partygoer has learned that lesson the hard way. 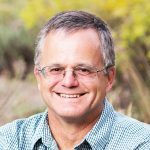 In addition to rain gear, Tahoe Adventure Company provides kayaks, paddles, life jackets, instructions and, at the end of the tour, hot drinks and snacks. Really, all you need is clothing you don’t mind getting wet that will keep you warm. I wore sports sandals and my feet were the only part of me that was cold. If you are lucky enough to have a set of wetsuit booties or river shoes, wear them. The tour began with a lesson on how to get into the boat and how to paddle. Then, we slowly paddled off shore where guide John Arsenault discussed how Lake Tahoe was formed. Late in the day, we had the lake to ourselves as we paddled toward the sun. The route passed Tahoe Vista’s charming lakeside resorts, as well as homes that seem to look larger and more dramatic from the water. 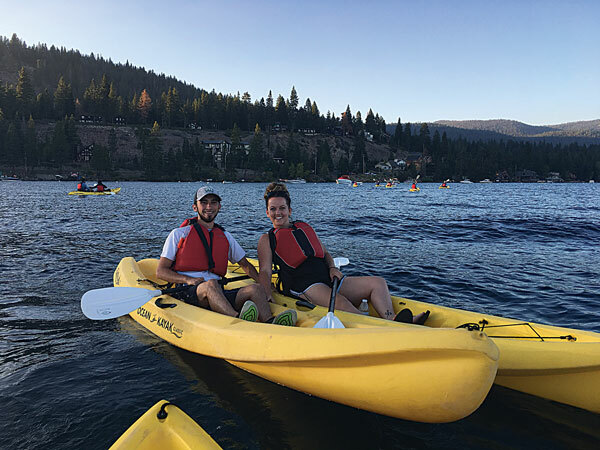 With the wide disparity in ability level of the paddlers, we stopped several times to marvel at the view, listen to more Tahoe stories and wait for the last of the kayaks to catch up. We had a mostly cloudless evening so our sunset unfortunately wasn’t a blaze of oranges and purples. However, the moon rise through the pink alpenglow made up for it. As we turned around and slowly watched the moon glide above the mountains, the alpenglow kept getting pinker and brighter. On the trip back to the beach the water was a shimmering pink glass. It truly was magnificent and the highlight of the trip — and timed perfectly. Just about the time the alpenglow began to dull and the first stars began to appear, we reached the shoreline. On the beach the chilly guests warmed up with hot chocolate and cookies, while gazing up at the slowly emerging stars. It was a marvelous evening, that I highly recommend to anyone who is visiting Lake Tahoe. 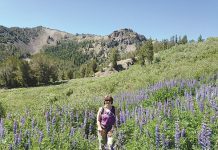 Tahoe Adventure Company has been running the full-moon tours for several years. 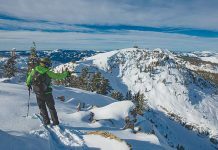 “Since the tours head out in the evening, they allow people to cap off their day at Lake Tahoe,” said Katie Hickey, co-owner and operations director of Tahoe Adventure Company. June 27 | Full Buck Moon | 6:30 p.m.
July 26 | Night before Sturgeon Moon | 6:30 p.m.
July 27 | Full Sturgeon Moon | 6:30 p.m.
Aug. 25 | Night before Corn Moon | 6:30 p.m.
Aug. 26| Corn Moon | 6:30 p.m.
Sept. 23 | Night before Harvest Moon | 5:30 p.m.
Sept. 24 | Harvest Moon | 5:30 p.m.
Oct. 24 | Hunter Moon | 5:30 p.m.